Size: Larva--1/16" to 1/8", adult is about one-fourth the size of a house fly. Identification: Eggs are shiny and creamy white, changing to black; aquatic larvae are light brown to black, cylindrical, twelve-segmented, with fan-shaped filamentous structures on the head. They attach to rocks with sucker devices on their rear end. Females lay up to 800 eggs on water surfaces or aquatic plants, logs, or rocks. Adults are stout-bodied small flies. Wings are broad and iridescent. Hump-backed, grayish with short antennae. Single pair of wings. Biology and life cycle: Found in huge swarms in late spring and early summer where swiftly flowing streams provide aerated water for the larvae to develop. Larvae attach to the rocks and other objects, including vegetation and concrete structures. After several molts, the larvae spin a basketlike cocoon in which to pupate in the water. Adults emerge from T-shaped slits in the cocoon and float to the surface in gas bubbles. Habitat: Larvae are found in running water feeding on microorganisms. Feeding habits: Males and females feed on flower nectar. In addition, the females need blood, which they get from several birds and mammals. Larvae feed on small crustaceans, protozoa, algae, bacteria, and decaying organic matter. The fan-shaped structures on the head are for trapping food from the water. Economic importance: Buffalo gnats will attack cattle, horses, mules, hogs, turkeys, chickens, sheep, dogs, ducks, cats, and wild animals. Organic control: Natural diatomaceous earth and plant oil products, herbal skin treatments for people. Vanilla sprays seem to be effective. See Appendix for formulas. Insight: Certain species may be gray or yellow. 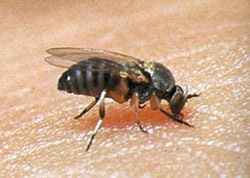 Turkey gnats and similar species have caused severe problems for cattlemen along the Sulfur River in northeastern Texas and Arkansas. In 1990 the pest spread into East Texas. According to Extension entomologist James V. Robinson, turkey gnats have been responsible for large kills of backyard poultry flocks. They also bite people.